I love Legos, and I (ob....viously) love Harry Potter so naturally i love Harry Potter Legos! Sadly for me, they're pretty expensive sets so I actually only have the Aragog set! Anyways, I bring this up because I just saw pictures of a new set from the Crimes of Grindelwald movie and I need it sooooo bad! This set includes a Grindelwald figure, a Seraphina Picquery figure, a carriage, and most importantly a thestral!! My patronus is a thestral so I definitely need this set! What about you? Do you have any Harry Potter Legos? Are there any sets you're saving up for? I have never been into legos, but I am really happy they have made a new set for it. I've seen the other Harry Potter Lego sets and they look really cool even if I wouldn't personally be interested in them. It's definitely another way of keeping the magic alive for fans. Fantastic Beasts is turning into this huge thing of it's own, and that makes me very happy that all these new games and experiences are coming out simply because of these movies. I hope you're able to get a set to add to the rest of your collection! Oh, look. 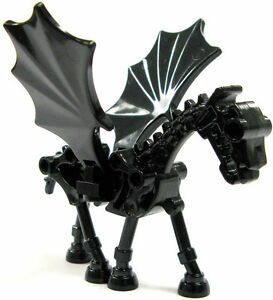 They have a thestral Lego! I don't think I want to look at the Fantastic Beasts ones. What if they have a Niffler? Back when the Harry Potter Lego sets first came out some years ago, I bought the Potions classroom set (which came with Snape and Peeves) and another set featuring Harry and Draco, two brooms and the Remembrall. I either lost or gave away most of the pieces that came with those sets (I have Snape, Peeves, a cauldron, a bright transparent yellow spider and a book from the Potions classroom set sitting on my shelf, but I’m not sure what happened to Harry and Draco). I am considering saving up for the new Great Hall set, especially seeing as it comes with a number of my favourite characters (McGonagall, Dumbledore, Hagrid). Oh dear I guess I shouldn't respond to this but whatever!! I have been a Harry Potter Lego collector from the very start. I have most all of the original sets and even a number sets that aren't even opened yet like Dagon Alley, The Burrow and a small Hogwarts Castle extension. My collections include The Castles (3 or 4), The Quidditch Pitch, Aragog, Chamber of Secrets, Prisoner of Azkaban, Hagrid's Hut, The Grave Yard, The Herbology Classroom, The Durmstrang Ship, The Night Bus just to name a few, as well as numerous small sets. Sadly Lego didn't offer any sets for the last book. I also have many other Harry Potter related items like watches, pins, scarfs, sweaters, t-shirts and miscellaneous items. I used to have three tall glass cases with just some of my sets and treasures, but once I moved from the East coast to the West coast of the USA I sold them. All my older sets are now in boxes waiting for me to find new ways of displaying them in my smaller apartment. I can't wait for my two grandchildren to get older and start to learn about the Harry Potter books and enjoy all the Harry Potter Lego Sets I will allow them to play with. Pottermore has finally released images of the new Harry Potter Lego sets that will be available in August!! I'm pretty excited for these in addition to ones from the new movies. I especially love that the Whomping Willow has a secret tunnel! Which one are you most excited about? I am most excited about the BrickHeadz, they look SO cute. The other sets look amazing too.